The Farmstead Golf Links is unique in that it represents the Grand Strand's only par 6 hole. A huge expanse of greens, Farmstead overs some 7,242 yards, marked by breathtaking beauty and incredible water hazards. Given the fact that you can choose from five sets of tees, you can still score well on this course, even if you are not a classic long-ball hitter. By far, Farmstead's most visually appealing hole is its par 3, which is known for testing the mettle of even the most experienced golfers. Through the use of multiple tee boxes, the greens crew can alter the hole each day--one day, you may have to take a long iron shot over water, while the next day you may not encounter the water at all. Of course, many will argue that the course's most challenging hole is the 18th, an impressive 767 yard, par 6. You actually begin play on this hole in one state and end in another, since you tee off in South Carolina and the fairway ends across the border in North Carolina. For a smaller, yet no less scenic course, you might want to consider a trip to Glen Dornoch, which opened for play in September, 1996. A creation of premiere golf architect Clyde Johnston, Glen Dornoch is known for its charming display of magnolias, oaks, and pines. 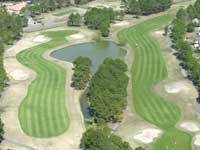 The course is also noteworthy for its elevation changes, which extend down to the stunning Intracoastal Waterway. Each hole is designed to blend in nicely with the natural terrain, which includes a maze of lakes, trees, and magnificent marsh and river views. Myrtle Beach golf courses are known for their innovative play, their natural beauty, and their rugged individualism. They tempt, they charm, and they challenge golfers who are interested in something just a little bit different, something just a little bit more demanding. They have a style and a mission all their own and they provide a particular sense of pride to the Myrtle Beach community. Come try one, just for the fun of it! 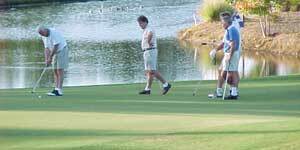 PlayChoice.com strives to provide golfers with online information about Myrtle Beach golf courses, golf packages, specials and discounts, to help plan great golf vacations! Hosting and Web Design by Myrtle Beach Inc. - Copyright ©1999-2005. No reproduction permitted with out written authorization.